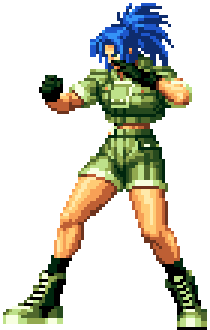 Leona Heidern (レオナ・ハイデルン) is a character introduced in The King of Fighters '96 as the new member to the Ikari Team. She is an Orochi descendant and the adopted daughter of Heidern. Leona is very quiet and does not like to talk much. She has a cold attitude, and, aside from Ralf, Whip, Clark and Commander Heidern, Leona does not talk to anyone. Leona is the last survivor of a destroyed village in the middle of an unknown jungle. She was found by Heidern, who adopted and trained her. She herself seems the be the reason for the destruction of her home village with her Orochi blood taking over her actions from time to time. She seems fearless on the outside, but she is afraid of hurting her friends because of her Orochi blood. Leona hates the sight of blood (because of the massacre she caused as a youth), but when she fights, she always seems to get covered in it. She's often lonely, but knows that Ralf, Whip, and Clark are always behind her. Orochi Leona uses the same moveset as normal Leona, but she moves faster and can combo moves that cannot be used as a combo normally. This page was last edited on 21 June 2013, at 01:33.